Parliamentary elections are taking place in Cambodia for the fifth time since 1993, when the civil war was largely ended with the support of a UN peacekeeping mission and a new democratic constitution establishing a parliamentary system of government was passed. Since then, the country has been recovering from the horrors of the past, which – next to years of internal conflict – reached its climax between 1975 and 1979 under the Khmer Rouge’s reign of terror. The nationalistic and ultra-Maoist-influenced group does not play a political role in modern-day Cambodia, but the tragedies of this period are far from being mended. Only in recent years and with the establishment of the Khmer Rouge Tribunal, a hybrid criminal court overseen by both domestic and international judges, has Cambodia begun to gradually deal this part of its history. Since a final verdict in early 2012 sentenced the director of the S-21 torture prisons to life in prison, the main proceedings against the closest associates of Pol Pot, who died in 1998, have turned out to be much more difficult. Most notably, the political influence exercised by the Cambodian government in the process has been repeatedly criticized. It will probably take at least another two years before a first sentence is passed down in this monumental case. Despite the traumas experienced, dealing with the past plays only a minor role in the lives of most Cambodians. More than three-quarters of them still work as subsistence farmers. The most important sector for export is the footwear and apparel industry, which contributes more than four billion U.S. dollars in export revenue a year. For the approximately 400,000 garment workers, the minimum wage was just increased to eighty U.S. dollars a month. Cambodia came through the global economic and finance crisis surprisingly well, and annual growth has averaged almost seven percent since 2010. But forms of extreme poverty are still widespread in several parts of the country. The wealth generated in Cambodia is very unevenly distributed and is increasingly being created at the expense of natural resources. In particular, conflicts over land ownership has been shaping Cambodia’s image for years. The core problem is the massive issuance of agro-economic land concessions to domestic and foreign companies, which now control about three-fourths of Cambodia’s total arable land. The impacted farmers are only minimally compensated for their loss, if at all. It is not uncommon for the businesses to forcefully evict the inhabitants with support from the Cambodian police or military police forces. Political repression has been rising again in recent years; freedom of expression, in particular, remains an oft-endangered commodity. The murder of an environmental activist and the interim detention of a well-known, independent journalist, among other incidences, have even set the Cambodian government under international pressure. Such “signals” are not lost on the Cambodians and will probably also be incorporated into their voting decision. Source: Karbaum, Markus 2012: Cambodia’s Façade Democracy and European Assistance. In: Journal of Current Southeast Asian Affairs 30 (4), S. 111-143. Only eight parties will compete in the parliamentary elections; in 2003, there were 23 and in 2008, there were still 11. Cambodia appears to be completing its development towards a two-party system this year: A handful of parties still won a mandate five years ago, but that number will probably be limited to only three this year. The runaway favorite is the Cambodian People’s Party (CPP) and their frontrunner, Hun Sen. 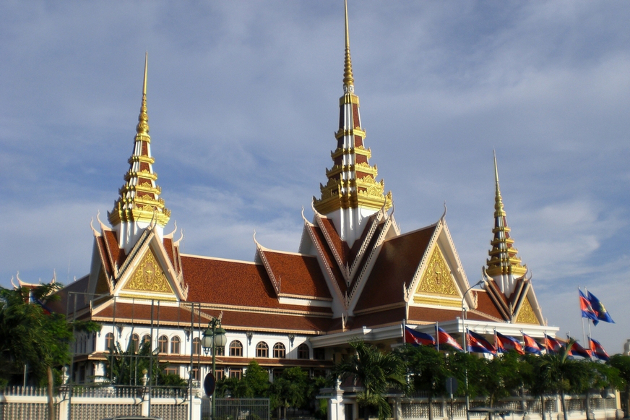 The prime minister has been head of the government since 1984 and dominates Cambodia with a brilliantly created network of politicians, generals and oligarchs. The backbone of his power is his private army, a privilege that no other politician has. The second largest party is likely to be the newly established Cambodia National Rescue Party (CNRP), which was founded by the liberal parties Sam Rainsy Party (SRP) and the Human Rights Party (CNRP) in 2012. Their president Sam Rainsy, however, fled from Cambodia in early 2010 to avoid an 11-year prison sentence passed down from several trials. Since he has been deprived of active and passive voting rights, his party has declined to nominate him as their candidate. Although he is still considered the party president since he won the election, the CNRP is sending Kem Sokha, the deputy party president, as their frontrunner in the election. As the third largest party, the royalist FUNCINPEC (Front Uni National pour un Cambodge Indépendant, Neutre, Pacifique, et Coopératif) can hope to win a few seats in 123-member strong National Assembly. While they were considered to be quite politically influential in the 90s, they have all but disappeared in recent years. Their frontrunner, Princess Norodom Arun Reaksmey, a half-sister of King Norodom Sihamoni, will be the first woman to lead a Cambodian party in a parliamentary election. During the campaign, everything is usually focused on the frontrunner and the mobilization powers of the subordinate party bosses. Although the candidates are elected by various provinces, they practically never act as representatives of their local constituencies, but rather primarily as members of their central party. Furthermore, the mandates are coupled to party membership – whoever renounces their party membership or changes parties, automatically loses their seat in the parliament. But the delegates face difficulties anyways: In recent years, the CPP has used their majority to strip several politicians in the opposition of their parliamentary immunity so that they could be brought in front of a court of law, which consequently encouraged self-censorship among the MPs. To discipline their own elected officials, the CPP Politburo has even gone so far as to request an undated letter of resignation from all parliamentary candidates, which in effect eliminates the independence of the legislature and creates a de facto imperative mandate. Not only do the delegates lack a free mandate, the parties also have a slightly different function: Unlike the established democracies of Europe, the Cambodian parties can hardly be sorted into a right-left spectrum. Even party programs are considered to be ornamental accessories despite urgent political challenges. While the CPP in the 80s – albeit under a different name – with nearly identical personnel, identified themselves with a Marxist-Leninist Soviet-style socialism, they stand today for a radical capitalist economic system without any significant welfare components. Content-wise, they emphasize their contribution to Cambodia’s development since 1979. Since that time, they have often succeeded in conjuring up images of an indissoluble symbiosis between the state, party and top staff. Due to a lack of intra-party democracy – with a partial exception of the CNRP – there are no open or pluralistic opinion-forming processes to put issues on the party’s agenda. Cambodian parties are generally much more heavily comprised of patron-client relationships, and despite alleged membership numbering in the millions, they hardly have anything in common with a populist party. Most notably, the royalist FUNCINPEC is comprised almost entirely of royal family members and their entourage. Although FUNCINPEC has only had two delegates since 2008, they continue to hold several positions as ministers without portfolios. Thus, they hold neither responsibility as a ruling government nor do they act as an opposition – pro forma government involvement and the associated sinecure alone define its raison d'être. Only the liberal CNRP can be partially associated with a political agenda. They are primarily considered to be a collection of disappointed Cambodians, who do not benefit much from economic growth and who no longer want to accept the daily abuse of power by public officials – Cambodia is one of the most corrupt countries in the world. The scope of the party, however, goes beyond the fight against bad governance, the lack of legal structures and the fight for respect for fundamental rights: For example, they are also for significantly higher wages for officials and garment workers, and in particular, they challenge the Socialist Republic of Vietnam – a close ally of the ruling CPP party since the 80s – with a strong nationalistic tone. Another obstacle on the path to a ruling majority for the CNRP is also the fact that a large majority of Cambodians cannot imagine voting for the opposition because they continue to be strongly influenced by hierarchical social structures and feel that their vote is also an important expression of loyalty for the government. The idea that political parties are in competition with one another and that a governing party can and should be voted out of office is not widely accepted in Cambodia, due to a lack of political education. The political competition between the parties is in all practicality undermined by various obstructions and shortfalls. Especially significant in this context is Hun Sen’s threat in April of civil war in the event that the opposition won the elections. It is thereby clear that all Cambodians understand that there is only one person in the country with access to sufficient resources to initiate such an armed conflict. Generally, it can be assumed that subtle and not so subtle forms of threats and intimidation will continue to be the CPP’s most effective campaign methods this year. In particular, it is not uncommon for the villages or communities whose votes for the ruling party fall below average to suffer (financial) disadvantages. Although it is prohibited by law, police officers and soldiers are allowed to be stationed near polling stations again in many places – a clear signal to all voters that sovereignty does not reside with the people, but with the armed peoples and their commanders. While the climate of fear is generally cultivated by the political elite in the country, other methods attack the electoral process much more directly. Alone the exclusion of the charismatic leader of the opposition, Sam Rainsy, due to a completely unreasonable – undoubtedly government orchestrated – court decision, should be enough to cast doubt on the legitimacy of the election results. In addition, there are also significant shortcomings in the voter lists, which have been identified by two independent studies. According to the studies, at least 10% of all registered voters are non-existent people – otherwise known as ghost voters. On the other hand, 11% of Cambodians who wish to cast a vote on July 28 are not registered as voters at all and will certainly be barred from participating. The opposition sees significant potential for manipulation, which only the governing party could exploit; the members of the CNRP fear being disenfranchised, which is ultimately reflected in an ever-declining voter turnout. This fear is certainly not pulled out of thin air, and because the National Electoral Commission has already categorically rejected a review of the shortcomings or even corrections to the voter list, it is possible that the election may have already become a farce long before the last weekend in July has arrived. Even if these factors ultimately turn out to have little influence on the election results, the CPP still has several other measures turn to. In particular, control over all TV and almost all radio stations provides them with a hard to underestimate advantage in voter mobilization. In addition, they use state infrastructure in the campaign or oblige officials such as the police or teachers to engage publicly for the CPP. Even German development aid equipment has been used for the ruling party’s campaign purposes. Due to the lack of equal opportunity in the election campaign, a CNRP victory is considered to be extremely unlikely. But even if the opposition manages to win an absolute majority against all expectations, a peaceful change of power is wishful thinking at best: Unlike in the countries of the Arab Spring, an unconditional mood for change is missing in Cambodia, since a majority still sufficiently benefit from economic growth, or at least feel like they are profiting. For this reason, the CNRP still fails to bring sufficient numbers of supporters onto the street – and at the moment, there lacks a final impetus for confrontation with the government. In contrast, the CPP remains closed behind Hun Sen, as it has been in recent years. Even their high level of internal discipline – dissent or disagreement is hardly recognizable from the outside – seems to not have weakened in 2013. Given the candidacy of so many sons of leading CPP politicians (having a son and a son-in-law of Hun Sen in parliament is among their aspirations), the ruling party can therefore fully concentrate on establishing a new Cambodian dynasty. It has little to do with a liberal democracy. Dr. Markus Karbaum is a political consultant specializing in Southeast Asia and runs the blog Cambodia-News.net. Cambodia: Stolen land, stolen elections? The 2013 elections in Cambodia are hardly expected to be free and fair. In this dossier, we examine what this means for the future of the country. Through analyses, interviews, films and studies, we pursue a critical discussion about Cambodia’s development, and give a say to Cambodian and German representatives of civil society and politics.